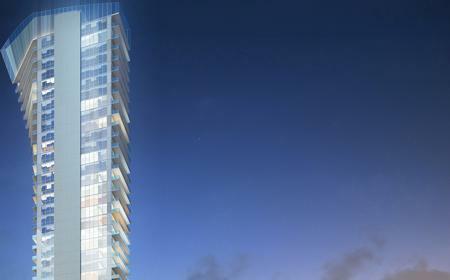 Muse is located in Sunny Isles, a world-class, waterfront destination on the striking coastline of South Florida. Lying between the Intracoastal waterways and the Atlantic Ocean, the island offers days of sun on white-sand beaches and an animated, sizzling nightlife. 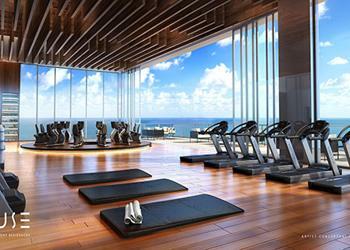 The nearby village of Bal Harbour offers a quintessential beach side experience. Upscale, open-air shops house designer brands, Chanel, Bulgaria and Jimmy Choo, to name a few, and an array of top-rated restaurants, including Makoto, Emerald Lounge, and Atlantico. Miami is a thirty-minute trip by car and offers a rich variety of entertainment, performing arts, galleries, outdoor sightseeing, and sports. 12’ ceilings. Italian marble or wood floors. Complete terraces with summer kitchens and weather resistant entertainment systems (Grill and TV). 8’ tall Italian entry doors. Sub-Zero / Wolf and Bosch appliances. Master closet fully finished with details in Italian leather. Wine cooler (148 bottles). 2 private elevators with biometric technology. Master bathrooms feature Dornbracht and Grohe fixtures. 75 inch TV in Living area hidden behind mirror wall. Smart Glass in Kitchen Island (allows closing kitchen off from the rest of the residence). Smart Shades technology (shades respond to sun position). Speakers built into the walls. With incredible panoramic ocean and Intracoastal views, each residence is delivered fully finished with inspired interiors by Antrobus and Ramirez, including outdoor living spaces. Private elevators service each residence. 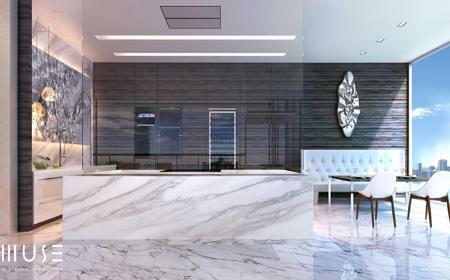 Interiors feature beautiful 8' Italian entry doors, exquisite marble and wood flooring, custom Italian cabinetry and personalized art from Helidon Xhixha. Expansive master bathrooms feature fabulous Dornbracht and Duravit plumbing fixtures, while the master bedroom boasts a midnight bar. The stunning kitchens are fit for a world-class chef, brimming with artistic design details and state-of-the-art appliances. The latest Sub-Zero and Wolf models, including expansive wine storage, are surrounded by endless marble countertops and exquisite, custom Italian cabinetry. At your whim, close the kitchen off from the rest of the residence with a concealed pocket door and dramatic sheet of counter-to-ceiling glass. 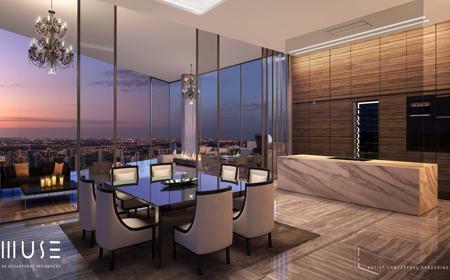 When closed, the glass becomes opaque revealing a striking stone and glass living-room wall. 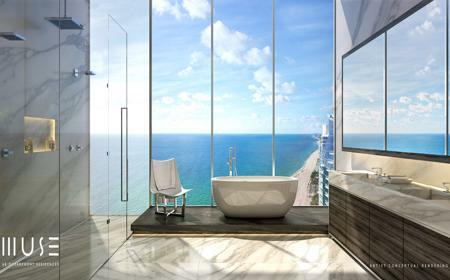 Marble covered bathrooms feature Dornbracht and Duravit fixtures, oversized soakers and floor-to-ceiling windows with countless other trimmings, all at the exceptional caliber found in every detail of Muse. Vast built-out, walk-in closets in the master bedrooms feature custom designed closet doors with leather inserts, and pre-installed shelving and drawers. The lights go up as soon as the room is entered at any hour of the night. 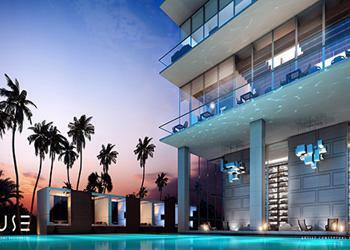 Unparalleled technology brings futuristic elements of convenience to these smart homes. From climate and lighting to safety and security, a fully automated home, effortlessly customizable, leaves you with peace of mind and more time to enjoy your own slice of paradise. Outside, the terrace boasts a high definition television and distributed speakers, specifically built for outdoor entertainment. With a fully equipped summer kitchen to complete the picture, experience indoor/outdoor living in the lap of luxury. In Muse, time is money. We have the automatic parking which can be operated from your smartphone to keep your car exactly where you want when you need it.